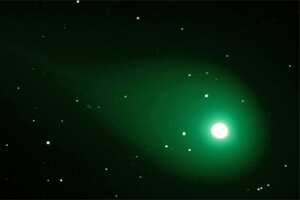 A very unusual green comet has made its way into our inner solar system. Its closest approach to Earth will happen on August 7th. Astronomers believe this is the first time this comet can entered the inner solar system. C/2017 S3 (the official name of the comet) was discovered on December 23, 2017 by the Hawaiian PanSTARRS telescope. As the comet has moved closer to the Sun it has been emitting more vapor. Astronomers have been witnessing some amazing exploding bursts from its surface. The most recent explosion resulted in the green halo now surrounding the comet. The greenish color is caused by cyanide gas mixing with carbon molecules being warmed by the Sun. The gas becomes ionized and glows. The halo is enormous, nearly twice the size of Jupiter – roughly 161,000 miles across (260,000 kilometers). Comet outbursts and gassing is common as comets move closer toward the Sun. Comets have widely elliptical orbits. They tend to extend very far beyond the Kuiper Belt (where Pluto and other icy bodies orbit) where it is very cold. Their orbits bring them into our inner solar system where they whip around the Sun. Usually around the time they cross the orbit of Jupiter they tend to heat up. The process creates the familiar cometary tail. When a comet races around the Sun it is at its hottest. This combined with the enormous gravitational force of the Sun can result in the comet breaking up and being destroyed. As is typical with these types of astronomical events, some are declaring the apocalypse is coming and the end of life on Earth is upon us. However C/2017 S3 will only come within 113 million kilometers to Earth during its closest approach on August 7th. Hale-Bopp brings closure to Heaven's Gate ... Our 22 years of classroom here on planet Earth is finally coming to conclusion -- "graduation" from the Human Evolutionary Level. We are happily prepared to leave "this world" and go with Ti's crew. The group believed that a spacecraft was hiding behind the comet and that they would be “captured” after their suicide. They would then go on to live for eternity with the aliens. The event stunned the nation at the time. It's amazing that similar predictions still arise whenever a comet starts to glow. It seems that we do not learn from the mistakes of our past. Nutjobs and crackpots aside, this comet is a truly amazing astronomical sight. If you have the opportunity for a viewing, do so quickly. As the comet may not survive its whip around the Sun. Update: As of August 7th, the comet is now too close to the Sun to see. We'll have to wait for it to (hopefully) complete its orbit around the Sun.